Der AMX M4 mle. 51 ist ein französicher schwerer Panzer der Stufe 9. Das Projekt 141 war eine Ausführung des schweren Panzers AMX M4 mit verstärkter Frontpanzerung. Die Entwicklung wurde November 1949 begonnen, das Fahrzeug aber nie gebaut. Das Projekt umfasste auch viele Berechnungen für verschiedene Wannen auf einem baugleichen Chassis. Der AMX M4 mle. 51 führt zum AMX M4 mle. 54. The AMX M4 mle. 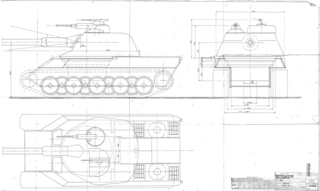 51 as represented in World of Tanks is a fictitious combination of one of the AMX M4's hull proposals and the TCB turret proposed for the AMX 50 Surbaissé (better known as the AMX 50B). 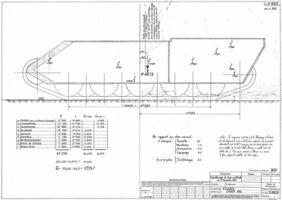 The hull and turret were never intended to be used mounted together. See the AMX M4 mle. 45 and the AMX M4 mle. 49 history sections for more information on the AMX M4 development history. 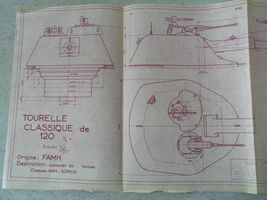 The cast FAMH turret, first proposed on the AMX 65T tank destroyer, was also considered for use on the AMX M4 model 1949. 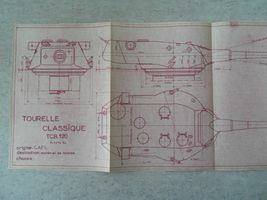 * The TCB turret was only ever intended to be used with the Surbaissé hull, known in World of Tanks as the AMX 50B. The armor thickness of the both the TCB and FAMH turrets is unknown and was most likely made-up by WG for balance purposes. The 127 mm/54 Model 1948 was a naval gun, and there are no known plans or proposals to ever use it as a tank gun. The name "AMX M4 mle. 51" is fictitious - by 1951, development of the AMX M4 moved towards less-armored tanks with oscillating turrets, unlike the earlier proposals that the AMX M4 51 represents. Diese Seite wurde zuletzt am 11. Februar 2018 um 18:24 Uhr geändert.